There are plenty of websites and books about the Panama Canal, but here is a very short overview of the history. In 1513 Vasco Nuñez de Balboa discovered that only a narrow strip of land separated the Atlantic and Pacific oceans. The Roman Emperor Charles V, who was also Charles I of Spain, initiated a movement to build a passage across the Isthmus. In 1534 the first survey was completed, with the conclusion that it was impossible. In 1848 gold was discovered in California, and the Panama Railroad was soon created to transport it across the isthmus. In 1869 President Ulysses S. Grant initiated survey expeditions across Central America that identified the route of the current Canal, but a more promising one across Nicaragua was favoured in 1876. The US ‘purchased’ the Canal from the French in 1903 for US$40 million, after assisting with the independence of Panama from Colombia. Panama was paid US$10 million, plus an annual ‘rent’ of US$250,000 from 1913. The US recommenced construction of the Canal in 1904. Their plan was to construct a canal with locks because (1) the 20-foot tidal range at the Pacific side and (2) to alleviate the flooding effects of the Chagres River during wet season. The construction was successfully completed in 1914 at a total cost to the US of US$375 million. If you add the French expenditure the total cost was a staggering US$639 million. The US controlled the Canal until ownership was passed on to the Republic of Panama after 1999 following the signing of the Torrijos-Carter Treaties in 1977. Until this time the US had complete authority and control of the Panama Canal Zone, which extended five miles either side of the Canal centreline (excluding the cities of Colon and Panama). Panamanians required special permission from the US authorities to even enter this zone. There is no exact figure for the number of workers who died, mainly due to tropical diseases, during both construction phases. The diseases did not discriminate between laborers and professionals. Guesstimates of the mortality numbers are in the tens of thousands! Today the Canal functions 24 hours per day every day of the year. This was not always the case. The Panama Canal Authority (ACP) only commenced 24-hour operations in 1963 due to the introduction of the fluorescent light. The Canal is 44.3 nautical miles in length from the northern-most buoy to the southern-most. Generally speaking most of the southbound traffic will commence their passage in the morning through Gatun Locks. Conversely north-bound traffic will commence their journey through Miraflores Locks at the same time. Vessels will cross somewhere on Lake Gatun where there is ample room to maneuver. However, if a vessel’s owner is willing to pay a premium they can transit either way whenever they wish. In general, tolls are determined by ship measurements parameters. To determine net Canal tonnage, the system applies a mathematical formula for the measurement of total ship volume. A net Panama Canal ton is equivalent to 100 cubic feet of volumetric capacity. The appropriate rate is applied depending on whether the ship is laden or in ballast (empty). The ‘laden’ rate is applied to ships carrying cargo, containers or passengers, and the ‘ballast’ rate is applied to ships that are not carrying neither passengers, containers nor cargo. Vessels less than 60 feet in length will pay around US$1000 for a full transit. Neo-Panamax vessels can pay up to US$1 million for the same transit! Every non-ACP vessel transiting the Canal will have at least one ACP representative on board. Vessels below 60 feet in length will have an ACP adviser. Vessels over 60 feet will have at least one Pilot. Some vessels such as car carriers, which average three per day, can have as many as three Pilots due to difficulty maneuvering around the locks. This park was created by decree in 1985 to protect the Rio Chagres watershed, which supplies 80% of the water needed to operate the Panama Canal, as well as the consumption requirements of the city. It is one of the largest national parks in Panama with approximately 130,000 hectares. It is the wildest of the reserves near the Canal and is home to many animals including jaguars and ocelots. Because of the variation in soil and elevation, Chagres National Park contains an enormous diversity of plants, with many endemic and South American species. El Camino Real, the trail used by the Spanish to transport gold, passes through the park. It is possible to retrace the path in a four-day hike. Local people say that the path is haunted by the slaves who built the trail and transported the undreamed of wealth of the Incas and the Aztecs across the Chagres valley. Your cruise ship will pass through a total of six lock chambers during the transit. There are a total of 46 gates (65 x 7 x 47-82 feet). The height varies depending on their location. 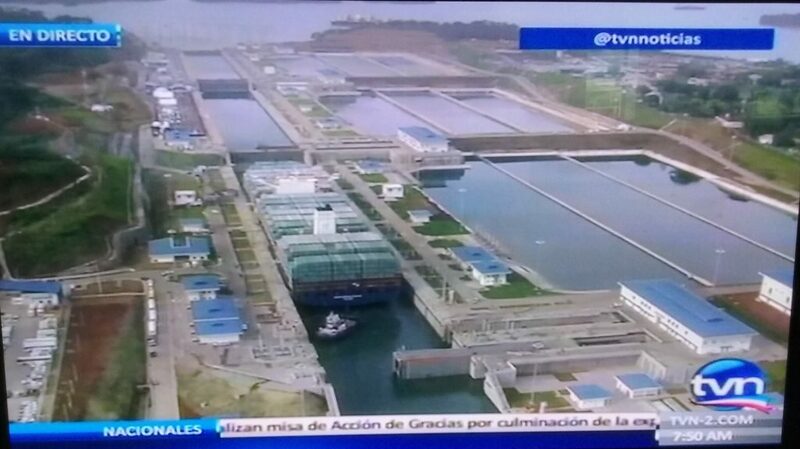 Miraflores Locks gates are the tallest, due to the variation in Pacific Ocean tides. The weight of each gate is 353.8 to 662.2 tons. The total volume of concrete used to build the locks was 3,440,488 cubic meters. Every vessel will pass through the locks under its own propulsion. The ‘mules’ function is to keep the vessel centred in the chambers. Initially the locks at Gatun had been designed as 28.5 metres wide but in 1908 the US Navy requested that they be increased to have a width of at least 36 metres to allow for the passage of US naval ships. Eventually a compromise was made and the locks were built at 33 metres. All the lock chambers measure 110 x 1,000 feet and can hold the equivalent of 50 Olympic pools (26.7 million gallons for three chambers). The fill time of each chamber varies between 8-15 minutes and is controlled by the Lock Master. An average of 52 million gallons of fresh water is used in each transit. The lock gates are often doubled for safety. This also means that the size of the chamber can be changed so that less water is used to fill it. The locks are filled with fresh water, which is moved by gravity through three culverts up to 6.71 metres in diameter, large enough to accommodate a train. 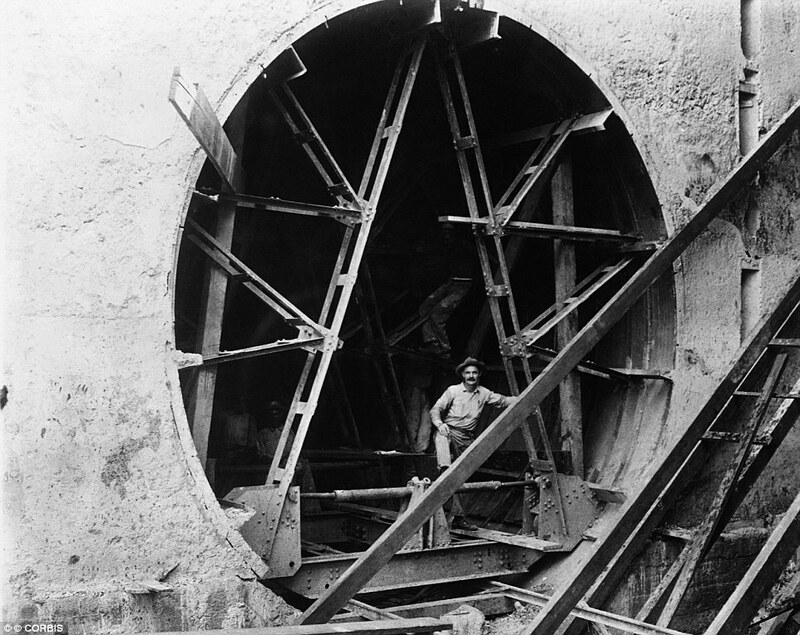 14 cross culverts move the water to 70 openings in the floor of the each lock, each 1.3 metres in diameter. 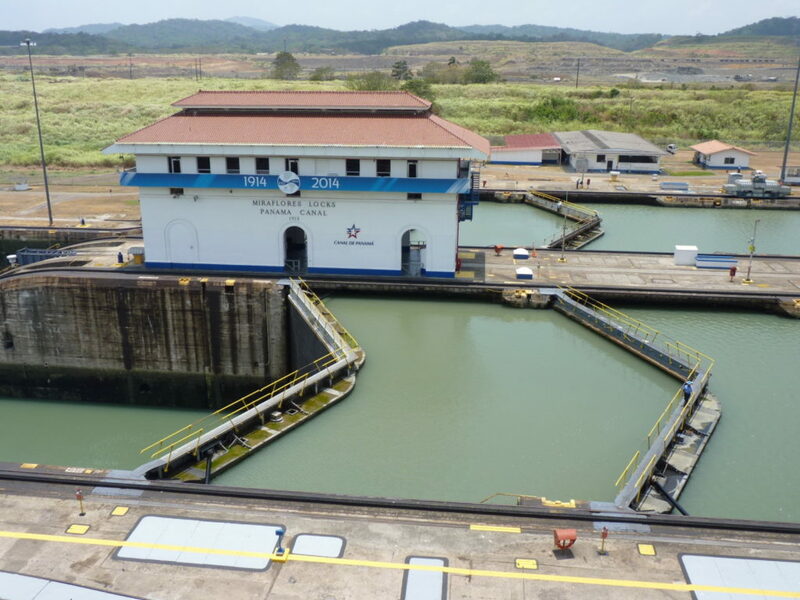 As you are probably aware, the Panama Canal recently completed a very expensive and protracted Expansion program to enable larger ships to pass through the Canal. This was finally completed in June 2016. The project involved new locks at either end of the Canal, and then widening, deepening, and straightening of existing channels. 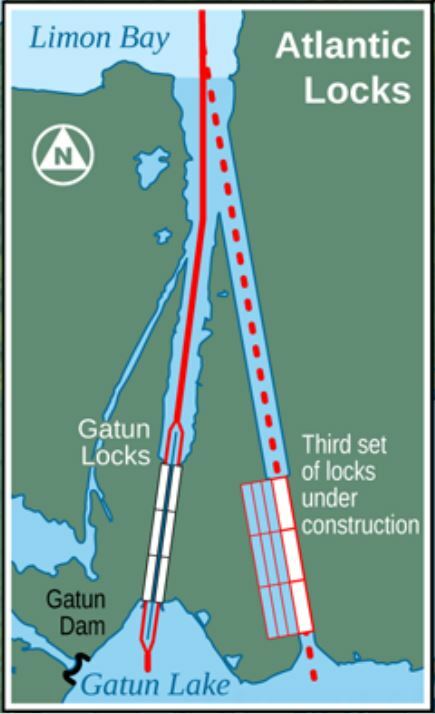 These graphics show where the new locks are situated, effectively parallel to the existing locks. At the Pacific end you can see that a channel had to be created to bypass Lake Miraflores. Water-saving basins were supposed to ensure that a transit used 7% less water than a transit through the old locks. However, ACP personnel we have spoken with are skeptical. Lake Gatun’s operating level was raised 45cm. All of the channels and approaches are still being widened and deepened to accommodate the big ships. Even if a big ship fits in the locks, it must still fit under the Bridge of the Americas. The new locks are called Cocoli and Agua Clara and each one is 1400 x 180 x 60 feet, holding 200 Olympic swimming pools’ worth of water. The old locks hold the equivalent of 50 Olympic pools. In the original locks there are two miter doors or gates that swing open. 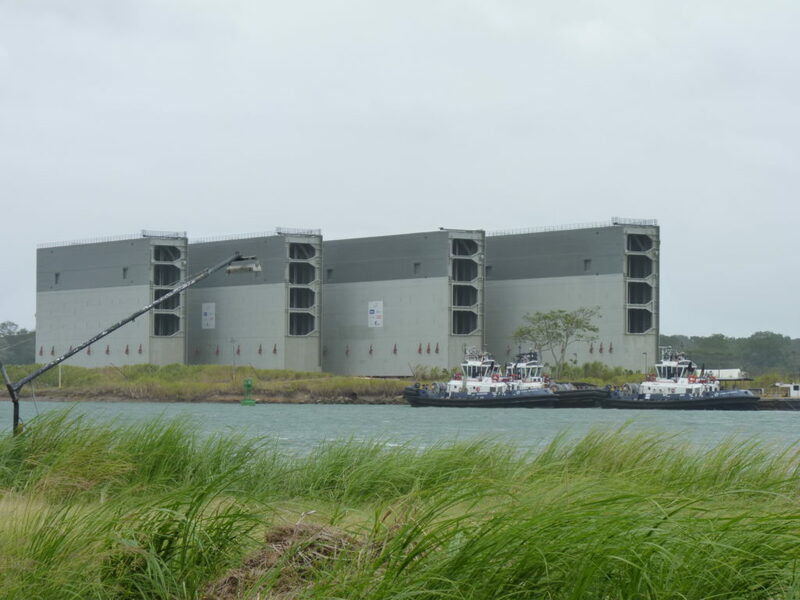 The new locks use enormous sliding gates, pictured here when they arrived in Panama having been built in Italy and brought to Panama by sea. The giant gates are 57.60 meters long by 10 meters wide by 30.19 meters high and weigh an average 3,100 tons. The rolling gates operate from concrete recesses, which can be turned into a sort of dry dock. This allows servicing of the gates on site, without the need to remove them and interrupt lock operations. Although the heaviest gates weigh nearly 3,700 tons, their design includes buoyancy chambers, which enables them to move on the track at a mere 15 percent of their real weight. Panamax ships are the biggest that can fit in the original locks. Panamax Plus will be anything bigger than this, up to the new Neo-Panamax. There are already ships too big for any of the locks. These are known as post-Panamax. Excavation of the new Pacific Access Channel entailed the excavation of some 50 million cubic meters of material along a 6.1-kilometer span. Work to expand the Panama Canal officially began in September 2007 with dry-excavation work for the creation of the Pacific Access Channel. Work on the Pacific Access Channel also required the clearing of more than 400 hectares contaminated with unexploded ammunition (UXO) left behind by the US military during its deployment in Panama Canal. Dredging work included the recovery of archaeological findings from the 16th century, and lots of equipment dating back to the French digging efforts. The Smithsonian Tropical Research Institute (STRI) collected many samples of rocks, sediment and fossils for paleontological research. Raising the level of Lake Gatun required modifications to some of the lock structures, and to the dams containing the lake. Throughout the project, wildlife rescue and relocation activities, and reforestation projects were carried out as ecological compensation for the expansion work. The ACP also paid many millions in compensation to Panama’s environmental authorities. The expanded canal opened on June 26th, 2016. This was local television showing the renamed Chinese vessel Cosco Shipping Panama making the official inaugural transit of the third set of locks. It started at the Atlantic end in Agua Clara and ended at Cocoli over eight hours later. This clearly shows the water-saving basins that are supposed to ensure that a transit uses 7% less water than a transit through the old locks. In reality they are not as efficient as hoped, and using them slows the operation down too much.